We were thrilled to hear that HBO’s Westworld was nominated for 22 Emmy Awards, making it, along with NBC’s Saturday Night Live, the most nominated show of 2017. Much of the hit sci-fi-western series was filmed here in Utah, with spectacular, otherworldly scenery captured in Castle Valley, Fisher Valley, Dead Horse Point State Park and around Arches National Park and Moab. The stunning backdrops continued to steal the show throughout the series and, if ‘film location’ were an official category, we’re confident that Utah would have been nominated. The show was nominated for ‘Outstanding Drama Series’, with various cast members, including Evan Rachel Wood, Anthony Hopkins and Thandie Newton, also nominated in each of the acting categories. The series also received nominations for directing, writing, costumes, editing, cinematography and many more. 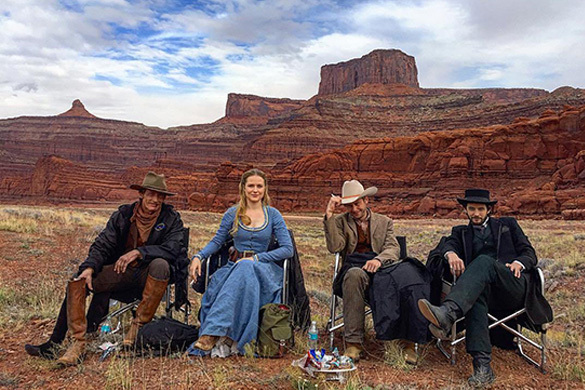 Jonathan Nolan, the show’s co-creator and executive producer, has spoken of being “drawn back” to southern Utah because of its “landscapes that don’t look like anywhere else on the face of the planet”. We are looking forward to welcoming back the cast and crew as they begin filming the show’s anticipated second season.